I feel I’m very fortunate to have become friends with Candace Robb, a novelist who’s had an influence on my work as a mystery writer. 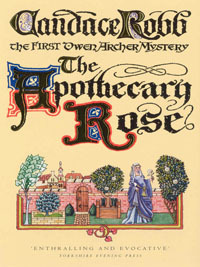 I’ve been a huge fan of her Owen Archer novels since I discovered them (they’re set in 14th Century York, but I found them in the library in Seattle). As Emma Campion, she’s written a pair of outstanding historical novels, and A Triple Knot, the newest, is set to be published very soon. Ironically, I did know that she lived in Seattle, too, or that, prior to that, we’d both lived in another city in America. Goes to show, small world. We exchange emails regularly, and when Candace suggested us having a conversation for her blog, I was flattered. The exchange has grown, so we’ve decided to split it between our blogs. This is part two – just follow the link here for part one. Chris: How do you think writing backgrounds affect the way we work? For instance, you came to this as an academic. Did you have to force yourself not to put in too much history? And what stylistic changes did you have to make? I came to novels from music journalism and writing quickie unauthorized biographies, where I had to write and research a book in 30 days (much of this was pre-Internet). For both of these, deadlines meant getting it mostly right the first time, and being direct. I’m still that way, I think. I know you revise and revise endlessly. I do more of it, but I try to get the real sense and shape of a book on the first draft. Candace: Interesting question! I began my university studies in journalism, then switched to literature after a few years. I’ve taught business, academic, and creative writing, and I worked for over a decade as an editor of scientific research publications at a university. So early on I trained in getting it mostly right the first time. And as an editor I was always up against deadlines. For the first 10 Owen Archer novels and the Margaret Kerr trilogy I was under fairly rigid annual deadlines. I seldom did more than two drafts. I simply didn’t have time. For the Emma Campion books I’ve had more time. It was quite a change to work on The King’s Mistress for four years; I wrote one version in two years for the UK market and then rewrote it for the US and foreign markets because they wanted a shorter book. But I’ve always thought of writing as a process and an exploration. When I reread I find connections and undercurrents that I’ve rushed past, and work on them to deepen the story. As far as forcing myself not to put in too much history, I haven’t been tempted with the crime novels, but I had a bit of a struggle writing The King’s Mistress and even more working on A Triple Knot. Joan of Kent’s story is so much a part of the beginning of the Hundred Years War, and that can’t be glossed over. Joan’s story was obscured by the historical detail in the first draft. Focus became my mantra in subsequent drafts, paring down to the essential. Chris: We both have politics in our books. Yours play out more on national stages, both in York and with the Margaret Kerr novels. And even more when you write as Emma Campion. Mine are far more local, since my feeling is that the doings of Parliament and kings would matter little to ordinary people and everyday life in 18th century Leeds. In my new Victorian series, there’s more politics, but it’s the politics of the working man, the strikes. Do you feel that the politics are a vital strand? Candace: I chose York as the location for the Owen Archers because of its political importance, and Owen’s identity as the Welsh outsider is an integral part of his character and his view of the world. So, too, I chose to lengthen John Thoresby’s term as Lord Chancellor of England in order to play with the politics of the realm. Owen’s return to Wales and his flirtation with Welsh rebels was something I very much wanted to do. And I wrote Margaret’s trilogy to explore the terrible burden of the Scots during their Wars of Independence, how the people suffered. So you might say that politics are my inspiration. Many of my plots grow out of political events. Chris: What other things play important parts in your books? For me, it’s music. There’s folk music here and there in the Richard Nottingham novels, because it’s what people would have heard. Some of the ballads, people scraping on fiddles, the music of the people. And in my Seattle books, the music is integral to the story, whether it’s the local sound that’s in Emerald City, just before grunge became big, or the country music in West Seattle Blues. I have a novel coming out next January, Dark Briggate Blues, set in Leeds in the ‘50s. It’s noir, really, but jazz runs through it, and Leeds really did have a jazz club then, a place called Studio 20, where the protagonist goes regularly. It’s a way to combine my two passions. Candace: I love how music runs through your books, how your language sings. As for me, I suppose the overarching interest is all aspects of medieval culture—music, clothing, drama, literature, ballads. And gardening, particularly medicinal gardens. So Lucie Wilton has a remarkable apothecary’s garden. Falconry. York and Yorkshire—I fell passionately in love with York and the surrounding countryside on my first visit and my love has only grown stronger with familiarity. That goes for Wales as well. A fascination with folk traditions that embrace the magical and the inexplicable. Chris: I already knew York well when I first came across your books, and your love for it was obvious. But you seemed to steeped in it that I believed you lived there. 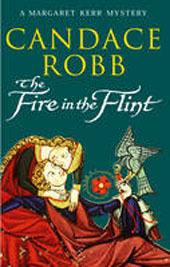 And you really do bring 14th Century York alive so well, to the point where the reader can taste and smell it. Like my books about Leeds – and also Seattle – they seem like love letters to the place, truly immersive experiences. Candace: Gingham? Really? Hah! Emma Campion exists solely because the marketing department at Century, my British publisher, wanted a way to distinguish the mainstream historicals from the historical crime novels. I had fun coming up with the name and practicing a new signature. But Candace and Emma both write in leggings and baggy sweaters. Chris: I know you’ve started work on a new Owen Archer novel, which will please many people. What else is in the future? The return of Margaret Kerr? Candace: Yes, I’m working on Owen Archer #11, A Rumor of Wolves. Then Emma wants to complete Joan of Kent’s story with The Hero’s Wife (title subject to change) and to give Queen Isabella her own book, tentatively titled Birthright. Isabella intrigues me—or, er, Emma, so she—no, we want to tease her out, find her passion. I have Owen Archer #12 in mind, the return of a popular character in the series. And then there’s something at the back of my mind, a concept and a few characters who are haunting me. The woman is much like Maggie Kerr, but I’m trying not to pin anything down, just jotting down impressions, not struggling to understand…. What’s in the future for you, Chris? Will you bring back my favorite sleuth, Richard Nottingham? How about John the carpenter from The Crooked Spire? Chris: It was my publisher’s decision to end the Richard Nottingham series, but they specifically said they didn’t want him dead (which, with my track record, was probably a good order to give). I do believe that Richard and I have unfinished business, and there are wheels slowly turning in the back on my mind. So he’ll be back, sooner or later. As to John the carpenter, I did start a second book with him, but it wasn’t working. Again, I have some ideas, so when the time is right, there’s a good chance he’ll see the light of day once more. 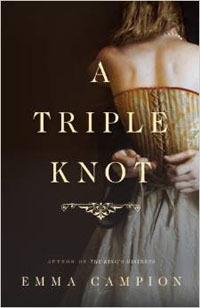 Finally, I’d recommend A Triple Knot to anyone who likes historical fiction. 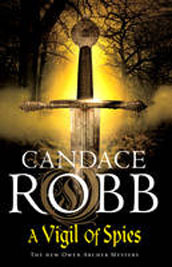 It’s the start of the tale of Joan of Kent, and it’s a superb read (I’ve been lucky enough to have already devoured it – you won’t be disappointed). And if you haven’t yet discovered the Owen Archer and Margaret Kerr novels, you have a treat in store.